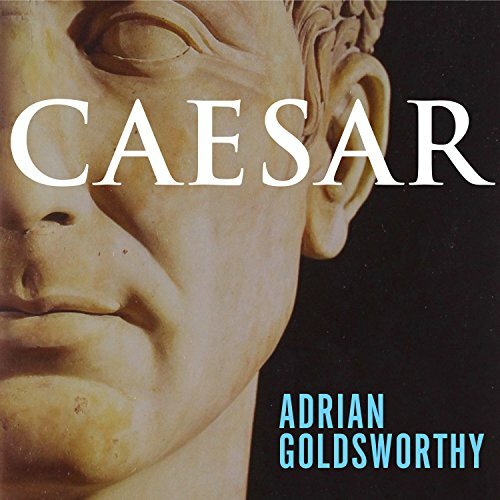 Tracing the extraordinary trajectory of Julius Caesar's life, Adrian Goldsworthy covers not only the great Roman emperor's accomplishments as charismatic orator, conquering general, and powerful dictator but also lesser-known chapters. Ultimately, Goldsworthy realizes the full complexity of Caesar's character and shows why his political and military leadership continues to resonate some 2,000 years later. In this landmark biography, Goldsworthy examines Caesar as a military leader, as well as his other roles, and places his subject firmly within the context of Roman society in the first century B.C. Excellent audiobook, I will definitely recommend it , so much information, thank you very much for the great audiobook. Well written and researched. Only one nit pick that due to the many different sources and centuries that have passed there was a lot of "we can only assume, the sources are not clear etc. Excellent performance, timeless story and, a telling that will stand the test of time. Highly recommended. Biographies have an in-built problem. They cover a person's entire life but, since that person generally does not do much worth recording until he or she becomes an adult, the part covering their childhood tends to be both boring and uninformative. Some people's early lives are interesting but most, like Caesar's, are generally bland and undocumented and the book ends up trying to fill space with no real information about the person and only speculation about the world in which he or she lived. Given that, Caesar is no better than most as a description of Julius Caesar's early life. The book does pick up as Caesar enters politics and becomes truly interesting and informative when Caesar goes on campaign in Spain. From that point I found the book hard to put down and more informative than any other book I have read on either this period in Rome's history or on Caesar's life. Given how long ago the events in this book took place Mr Goldsworthy has done an excellent job of telling the reader when events are speculative and presenting not only what he believes to be the correct re-telling of what happened but also presenting other views and the reasons he believes the ones he specifies are the correct interpretations. This alone makes this book worth reading. Once Caesar has gone on campaign with the Army the description of the events and battles he took part in go a long way to explaining why he is considered to be such a colossus of an individual. All of Caesar's battles are covered as well as an explanation as to why these were important to Rome and why Caesar was considered such a great general. Caesar's return to Rome, his crossing of the Rubicon with his Army, his subsequent campaigns in the civil war and his terms as dictator are also covered in detail and the book only gets more interesting as it describes the events leading to Caesar's death. There is also a small section covering the subsequent civil war, the rise of Augustus and the end of the Republic although, as Mr Goldsworthy makes clear, the Republic had actually ended earlier than the assumption of the position of emperor by Augustus. One of the things Mr Goldsworthy has done in this excellent book is present the world of that time as a real place with real people and at no time did I start thinking of Caesar and his world as anything other than composed of real living beings. It is easy when reading about life in the ancient world to think of places like Troy or Sparta as fictional locations rather than real live cities with real live people. Not so with this book. Mr Perkins has done an excellent job in the narration and the book is well worth listening to if you are interested in the final years of the Roman Republic. I trust Google translated "My Way" correctly the way, with the Sinatran vibe it connotes. I think a very even-handed look at an historical figure who's often been characterized as a power-hungry madman, setting the record straight on his case against the aristocrats of Rome. Goldsworthy paints a vivid picture of Roman political life circa 1st century BCE, how it sat on a figurative powder keg bound to be lit by any number of cravenly ambitious men, and how the events of 49 BCE conspired to make Caesar the one who crosses the Rubicon. The book also excellently portrays Caesar's generation of peers coming of age during the Social Wars, the bloody Sullan/Marian civil wars and Spartacus' uprising, when many of the Republic's ancient checks and balances were irreparably damaged. No surprise many saw use of violent force the only way to power while others, haunted by the Sullan/Marian dictatorships' recurrence, doubled down on stamping out any attempt at one man gaining special powers at the expense of the public good. My only complaint (and this is due to my own laziness) is the middle third's concentration on the Gallic Wars. All those tribe names begin to sound the same after awhile and there's lots of talk about building camp and gathering supplies. I'm nitpicking really, b/c the Gallic campaigns are what forged Caesar the military genius- gave him his connection to his legions and in the process merely changed the couse of Western European history forever. Derek Perkins narration is superb. Adrian Goldworthy's writing and research are superb. An excellent treatment of Caesar, the world he lived in, and how he came to power. This puts Caesar in the context of waning days of the Republic, and situates him in pre-dawn of the Imperial era. Although Goldsworthy is clearly biased toward his subject, he argues his points well when grappling with questions and controversies raised by other scholars. I learned a lot--and really enjoyed it in the process. Every March 15 I think about Julius Caesar, but since I only have a few thoughts, I decided that a 25 hour book would fill some gaps. As expected, it’s jam-packed with military battles and the political intrigue of the Roman Senate. But this book also shares details that left me in shock. For example, there was the widespread practice among Roman Senators of seducing a rival’s wife to gain a political advantage. Also, as a demonstration of leniency following a bloody battle, to cut off the hands of the defeated army and setting the soldiers free. I was also surprised by Caesar and Cleopatra’s motivations for becoming friends with benefits. And finally, the narration is delivered with an academic voice that frequently reminds us that demeaning, mutilating and using others was very acceptable in the ancient world. If you could sum up Caesar in three words, what would they be? While the order of information some times jumps back and forth in a confusing way, the story of Caesar is brought to life here by Derek Perkins' excellent narration. I wish all history books were narrated by him quite frankly!Clocking in at 24 hours 46 minutes, this took me almost a month of daily driving to get through and I was enthralled through every bit. This really does feel like a complete telling of Caesar's life and done in a way that makes the events seem vivid and exciting.Highly recommended for fans of history and for those curious about the minutia of the daily life of Romans during the time of Caesar's life. What does Derek Perkins bring to the story that you wouldn’t experience if you just read the book? Derek Perkins does a wonderful job of sounding authoritative but still playful. His pronunciation, diction and general style fits the subject matter wonderfully and enhances those few mundane areas. He does a fantastic job here, kept me interested through all ~25 hours of the book! The story of Caesar's capture by pirates was particularly entertaining. I won't spoil it here though! Be aware, this is a LONG audiobook. Put aside a month to get through it.There is also a lot of similar sounding names and places, so if you don't have an ear for that you may find it a little confusing. The narration does help this a lot however, but be aware nonetheless. This is the well told and researched tale of one of the most prolific men who ever lived. Caesar exploits, his sheer determination and ability to invest his whole existence into great and dangerous gambles make him a both a model for the ambitious, and a warning for those who would rather live the quiet life. Goldsworthy does a strenuous and well documented job of putting a complicated life in perspective, and showcasing both the genius of Caesar's leadership, his personal scandals and exploits, and a life that reads like no other. A fine and enjoyable book for anyone who wants a clear picture of the man. Notably read by Derek Perkins. I've read and loved this as a book. This Audible book exceeded my expectations. The choice of narrator is wonderful. He is clear, steady and a pleasure to listen to. The 11 hours flew by. Arrian writes a wonderful book that is informative, engaging and full of action. If you are looking at this, don't think, just buy it. You'll be as happy as I am. Adrian Goldsworthy’s "Caesar: Life of a Colossus" surprisingly reveals that Gaius Julius Caesar is a methodical builder of power and prestige. Caesar is shown to be a giant of history after years of work as a self-confident manager of people and events. Caesar is pictured as a consummate leader that manages those in high and low positions in Roman society. Caesar’s rise to power reminds one of Lincoln or Churchill rather than Alexander or Napoleon. Lincoln and Churchill are in their middle years of life as they rise to fame as influential orators and mature men of action. Alexander and Napoleon, though certainly men of action are young shooting stars. Alexander and Napoleon are world conquerors in their 30s, while Caesar is in his 40s when fighting the Gallic wars; wars that only begin his steep climb to immortality and fame. The Civil War and WWII solidify reputations for Lincoln and Churchill. The Gallic wars frame Caesar’s historic stature. Caesar, like Lincoln and Churchill, are seasoned by life before they become colossuses. Of course, Lincoln and Churchill are not entirely apt comparisons because Caesar created military and political loyalty at the front of combat while Lincoln and Churchill created loyalty from behind the lines. Goldsworthy suggests that Caesar is one of the greatest leaders of all time. Driven by belief in his ability to understand the public, his soldiers, his competitors, and his enemies Caesar forged an empire. Through luck, skill, indefatigable energy, and intelligence, Caesar grasped power and used it to change the course of history. The author is thorough and the material very dense. The narrator was competent but offered little passion. I finished the book - but it was a chore. Great topic. Not a great experience.